First, to everyone’s surprise, Sony introduces DivX support to the PlayStation 3, and now we learn that PlayTV, the company’s yet-to-be-released digital TV tuner and recorder, won’t be employing copy-protection. 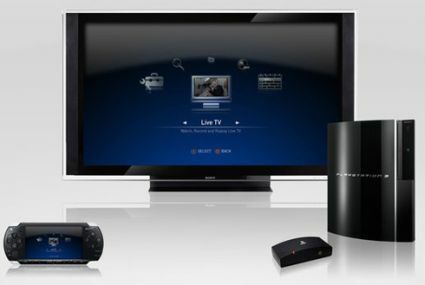 As a result, television programs can be transfered off of the PS3 onto any device that supports MPEG2, including a PC where they could be re-encoded and shared on the Internet. Leaving television recordings DRM-fee isn’t a standout feature of PlayTV, since most PC-based DVR software does the same. But, in Sony’s case, this is from a company that owns a major Hollywood studio – Sony Pictures – and introduced the now defunct but copy-protected format ATRAC, along with the notorious root kit which installed itself onto consumers’ PCs unwittingly. And, as a good friend of mine likes to point out, Sony Pictures DVD releases tend to be the hardest to rip to an iPod as they commonly feature additional encryption and “bad” sectors. However, the more I think about it, the recent update to the PS3 that added DivX support, while welcomed, is a much bigger deal and marks a real sea change for Sony. DivX is the most common format used for DVD rips that are shared illegally on BitTorrent networks and other filesharing systems, and while many device makers add DivX support in order to sell more units (imagine a digital audio player that didn’t playback MP3s), they don’t normally own a major Hollywood studio. And before readers point out that there exists plenty of legitimate DivX content (although less as of this week), true as that maybe, just feast your eyes on any of the main torrent trackers and you’ll get the point. Why would it have copy protection? This is stuff freely available over-the-air. In fact, here in the US the cable co’s are regulated by the FCC to provide the locals unencrypted. (And I believe STBs are supposed to have active Firewire ports for content retrieval.) For me the story isn’t the lack of encryption, it’s providing methods to move the content off the PS3 – whether via placeshifting or transfer/download. I agree that the ability to get content off of the PS3 is the real point with regards to PlayTV, and very welcome too (for iPod encoding not least). Point well made. Here in the UK cable and satellite dvrs make it impossible to move content, I think. However, for me it’s DivX support on the PS3 that is still blowing my mind. I have a PS3 and stream DivXs from my Mac flawlessly.